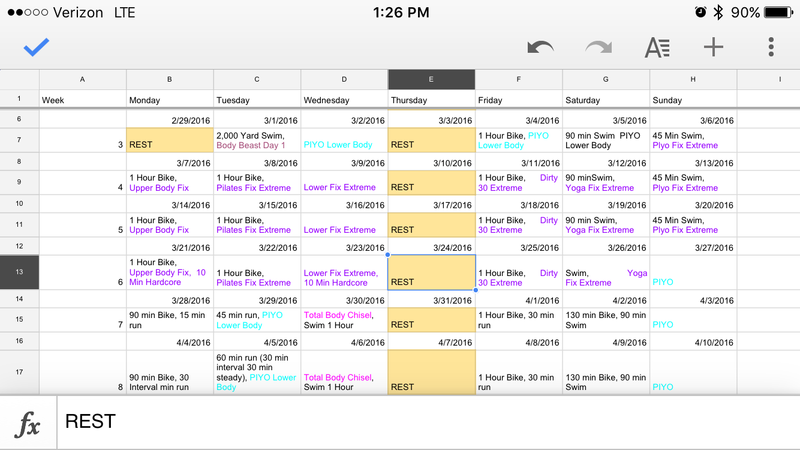 I’m going to be completely honest and say I have slacked this week on my training plan. It isn’t out of lack of wanting to train, in fact I have been dying to train, I just can’t seem to get my back to not be tight / spasm after my workouts. I was planning on doing 21 Day Fix as my strength training but I was kindly reminded by my husband how my knees hurt while doing the program and given the biking and running needed it would probably be best if I waited to do another round. I reluctantly agreed and was super thankful I have an amazing husband! That is when I decided on Body Beast as the strength component of my triathlon training program. I was in the middle of doing Hammer and Chisel when I created the program and I was really digging all the lifting and made me miss Beast so I hopped right in and started it. I started to feel tightness in my back during the middle to end of completing Hammer and Chisel. I thought it was due to the jumping in some of the workouts so I figured I would give it at least 5 workouts of Beast before deciding to keep it or change to a different strength program. Unfortunately, I have to make the switch and drop Beast. My body desperately needs the stretching workout that yoga / Pilates provides. I also think that my quads, chest and abs became significantly stronger during Hammer and Chisel, enough to create a muscular imbalance to pull me out of alignment. Now, I’m going to work on my hamstrings, glutes and back to even things out a bit. To counter this effect I am going to do PiYo and only swim for the rest of the week and see where it gets me. If I feel better then it will be my go to program. If it doesn’t then I will go to the doctor to rule out injury. Here’s to a pain free back by Sunday!! Pilates and Yoga will be a fantastic choice. Maybe you will consider reading my article ‘mummy needs a rest (day)’ – even if your not a mum…. Allow yourself time to rest (which it seems you do) But don’t be hard on yourself for needing to change things up. All the best for a speedy recovery! Thanks swimridemum! I’ll go check it out.